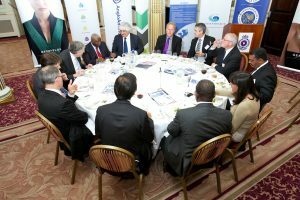 Mozambique: Presidential round table lunch in London. Very soon after I started volunteering with the Commonwealth Business Council I realised that a perk of this job was “rubbing shoulders” with high profile people! The day-to-day office job was a bit of a routine. But once I stopped to think about it, the final product can be pretty impressive to tell your friends about. I get to be in the same room as presidents, ministers and top CEOs! On a regular office job the great majority of us never actually come close to these VIPs. My very first opportunity to be part of such a moment was during a visit to London by President Armando Guebuza’s of Mozambique. HE Armando Guebuza was the guest of honour at a business lunch organised by the CBC on May 8th. During the visit’s preparations I busied myself helping my colleagues prepare the final list of guests who had confirmed attendance. We produced name badges – taking special care to check that we did not accidentally enter “Miss” where it should say “Mr”, or worse even, that we haven’t inadvertently addressed an accompanying Minister as “Mr” instead of ” The Hon Minister”. It is amazing how relatively small things can take a whole new level of importance when you are dealing with a presidential aid who does not want to hand over a badge to a Minister knowing that his tittle is “incorrect”. 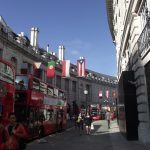 Armando Guebuza was in London with a business delegation which represented more than 20 Mozambican companies as well as the CTA (Confederation of Mozambican Businesses) and Mozambique’s National Promotional Agency. The President addressed an audience of around 150 Business representatives. HE briefed them on the opportunities to engage with Mozambique on investment & trade. He focused on mining, oil & gas, agriculture and infrastructure. As my first “Presidential Forum” I felt very engaged, mostly because, as I was the only CBC Portuguese speaker there. When I approached members of the presidential delegation they seemed to feel that special care had been taken for this visit. Even though I knew it happened completely by chance. 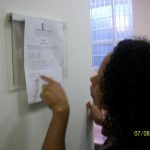 As an intern I had ‘first-refusal’ on manning the registration desk, in other words, ‘forced’ volunteer!